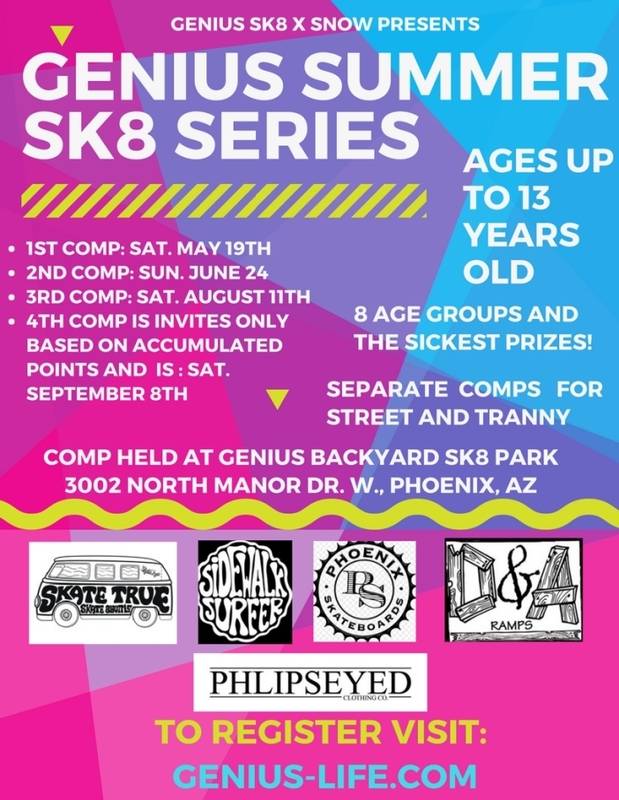 The Newsletter is here to keep everyone in the Phoenix skate scene up-to-date and in-the-know about upcoming events and happenings. Below, you’ll find the June community calendar with detailed information about each event. If you have an event you’d like to add (or corrections for any of the events below), please e-mail the information to budstratford@aol.com. Thanks for supporting your local skate scene, and your local skate shops…! Mark your calendars! 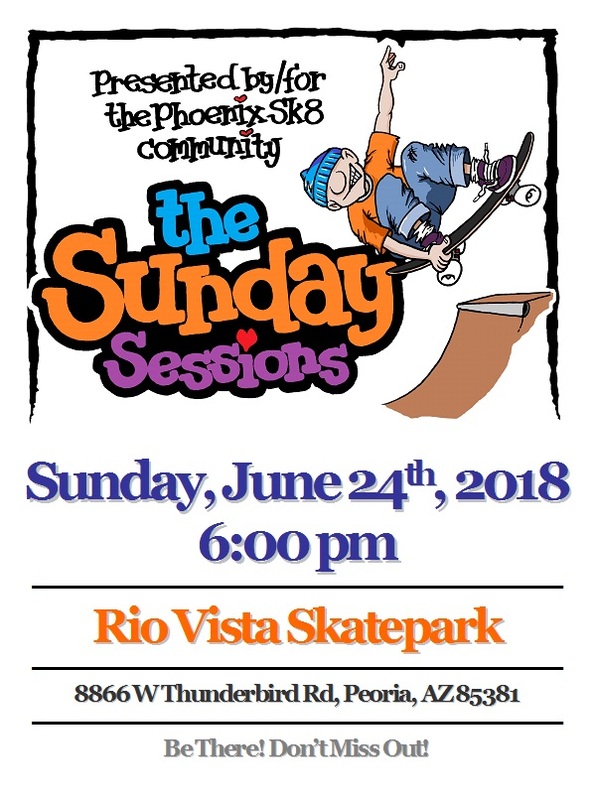 The second of The Sunday Sessions will be happening on Sunday, June 24th, 2018 at Rio Vista (Peoria) Skatepark at 8866 W Thunderbird Rd, Peoria, AZ 85381. The Sunday Sessions (Rio Vista) Sunday, June 24th, 6 pm *Next up! 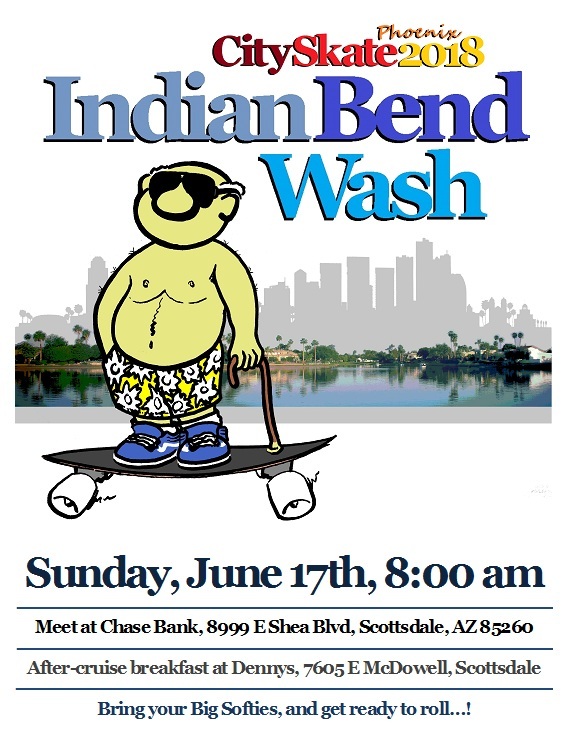 Being a Skateboarder in Arizona you probably have a love-hate relationship with Go Skateboarding Day. On one hand it’s a day that’s focused on what we all love to do, but on the other hand, it is in the middle of the brutal Arizona summer often hitting over 110 degrees. So this year with some help from Emerica and the rest of the skateboard industry we have an awesome compromise! An indoor Mini-Ramp Jam in the A/C with prizes for best trick and whatever else we decide. 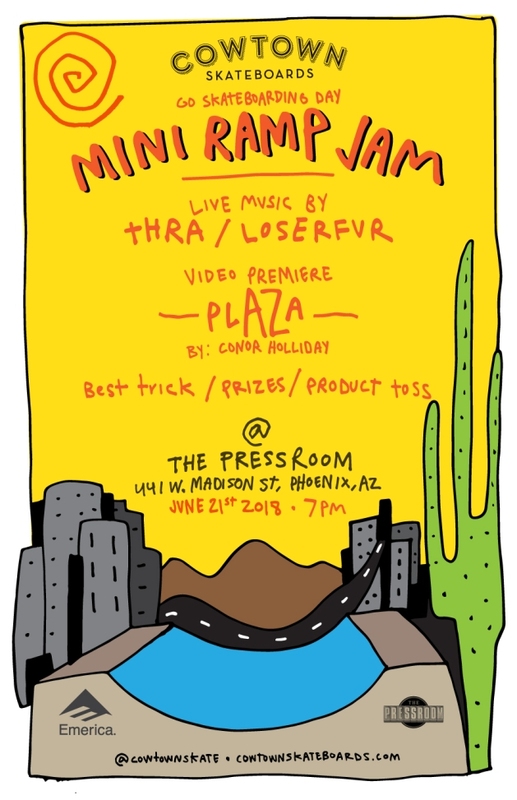 On top of that will be premiering Conor Holliday’s latest video “plAZa”, live music from THRA and LOSERFUR and end it all with a product toss to everyone in attendance. So join us on Go Skateboarding Day June 21st at the Pressroom in Phoenix starting at 7:00 pm. Free to attend and all ages are welcome! The Grill and Chill events are always massive fun. 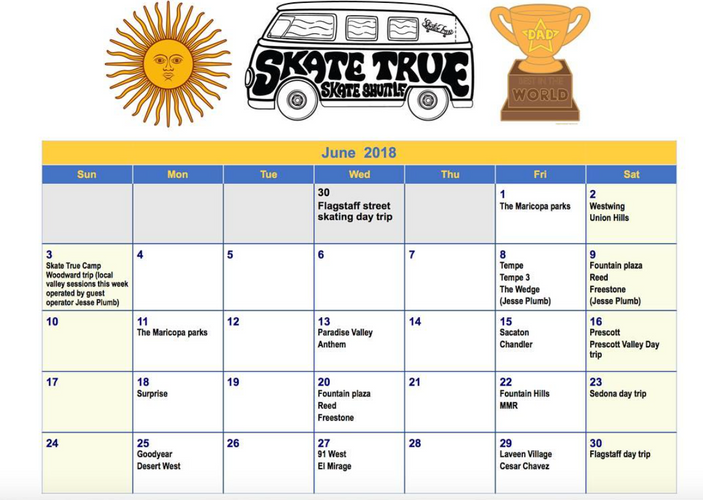 Easygoing, relaxing, lots of good friends, great skating, and excellent times, they are not the types of events that you want to miss. 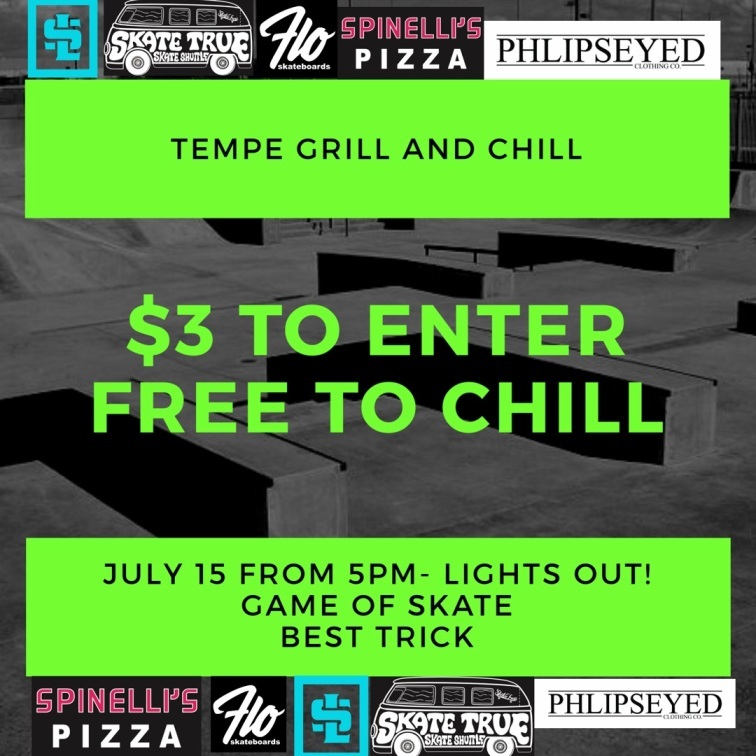 Sponsored by Lifestyle Clothing, Skate True, Flo Skateboards, Spinelli’s Pizza, and Phlipseyed Clothing Company.